BioWayste and Brocklesby Ltd of North Cave near Hull, are delighted to announce the signing of a Build Own and Operate contract for 6 years to provide green electricity and heat from BioWayste’s £2M high rate anaerobic digestion process technology. In a landmark move, Brocklesby Ltd. have chosen BioWayste as its exclusive partner to run and manage the 40,000 ton p.a. AD Plant on its 7 acre site. Six of BioWayste’s high rate reactors along with CHP engines will provide Brocklesby with 75% of its current electricity usage, all generated from waste products currently being tankered from site. The BioWayste plant will make green energy by treating the waste on site using their high rate anaerobic digestion process, and disposing of clean effluent via Yorkshire Water’s infrastructure. “It makes great sense for Brocklesby to continue the process of recycling already at the North Cave Plant with BioWayste AD technology. Not only are we removing tankers from the local road infrastructure we are reducing Brocklesby Ltd’s reliance on fossil fuels by making green energy from waste on our own site. Brocklesby have invested heavily in the North Cave plant over recent years, creating many local jobs. The BioWayste plant will help our carbon reduction programme and will provide more local employment opportunities. This high rate anaerobic digestion process plant will also save us money and give us long term, sustainable green energy”. The BioWayste plant will be owned, financed and operated by BioWayste thereby allowing Brocklesby to receive a secure green energy supply from its waste without the need to diversify from their core business. The BioWayste AD plants are small footprint installations and this one fits easily into the corner of the ever expanding Brocklesby site. As the technology is a modular system of high rate reactors with the ability to expand the plant alongside the Brocklesby business model, BioWayste are able to service the current stream and grow with Brocklesby’s aspirations. All of the BioWayste technology is pre-fabricated and arrives on site ready for plug & play installation, further increasing the sustainability of the total solution. 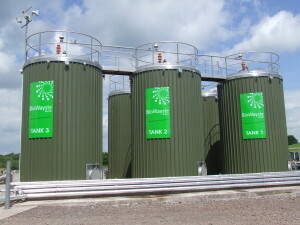 Their high rate anaerobic digestion process design also reduces installation time thereby giving Brocklesby larger savings with early green electricity production. “BioWayste are delighted to be working with Brocklesby on this project. The Brocklesby team have chosen BioWayste for a six year partnership to make green electricity and heat from their final effluent waste. Working with other partners including the Environment Agency and Yorkshire Water, we aim to provide a fully automated and controlled service to Brocklesby using locally recruited trained operatives and management. Like Brocklesby we are committed to clean, green and sustainable energy whilst minimising the impact on the site concerned. Using AD to treat Brocklesby’s effluent stream compliments Brocklesby’s existing business model, recycling and re-using food waste products from across the UK. The main Brocklesby Plant will now be able to use green energy to assist in their already sustainable business further reducing their carbon footprint. This is excellent for both the environment and local infrastructure, giving long term cost benefits to Brocklesby without the need for them to have a further process to manage. A genuine win/win situation”. Both Brocklesby and BioWayste assist a large number of food and beverage companies with their waste management. This high rate anaerobic digestion process plant will ensure that many of Brocklesby’s clients will know that the final destination for their waste will be in green electricity production and will only add to their whole food chain sustainability credentials. E3 has developed the AGF process that utilizes biogas for the flotation, concentration, and recycle of a concentrated bacterial biomass stream. Consequently, SRT / HRT ratios greater than three are achieved. An SRT / HRT ratio of three means that the digester size can be reduced to one third of the conventional size while achieving the same percentage solids conversion to gas. check out the linked on name above. honest but your site is really nice. Keep it up giving us more like this! Expensive toys for the farm boys! All sounds good but £2 million. That’s an investment. 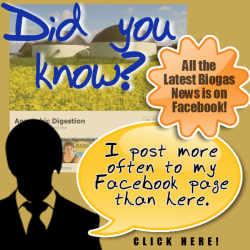 This whole thing works best when the site has its own waste source to feed the facility with biomass. It should work very well.